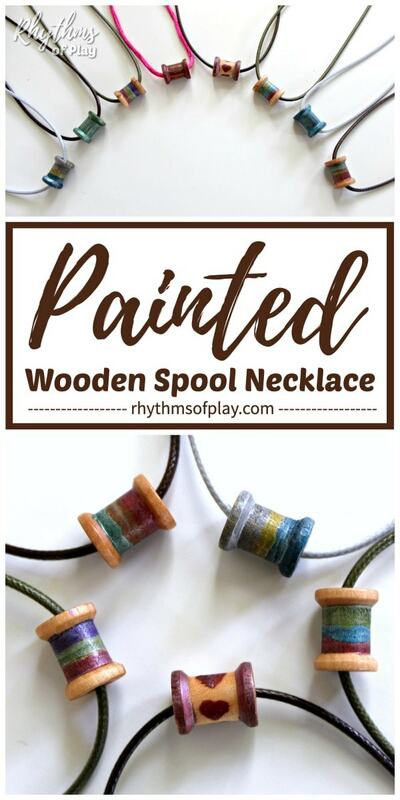 A painted wooden spool necklace is a simple gift idea that kids can make for a friend, teacher, parent or grandparent. 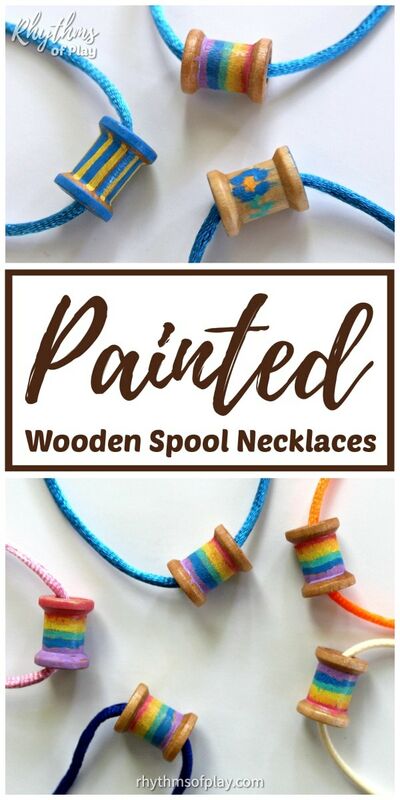 Decorate wooden spools, and then make them into personalized necklaces or friendship bracelets with this easy jewelry making tutorial DIY. The best thing about a painted wooden spool necklace or bracelet is that you can personalize the wooden spool however you like for mom, dad, a friend, or a favorite teacher! Use paint pens to decorate wooden spool beads and then string one or more painted wooden spools onto a necklace or a bracelet. A simple jewelry DIY with gorgeous results! 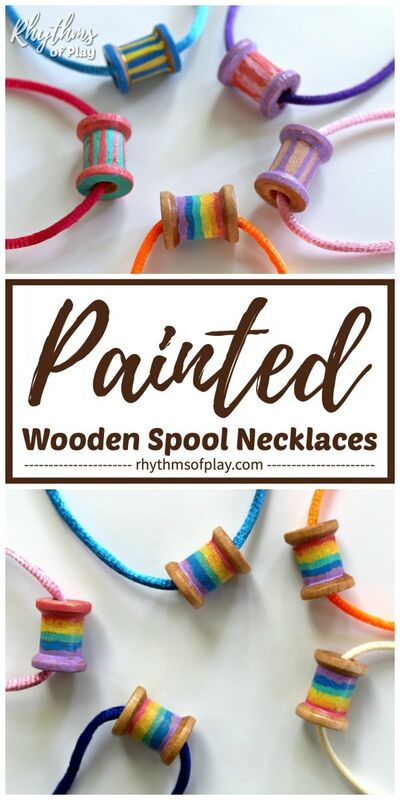 Wooden spool necklaces and bracelets are an easy gift idea that kids can make for a friend, teacher, parent or grandparent. 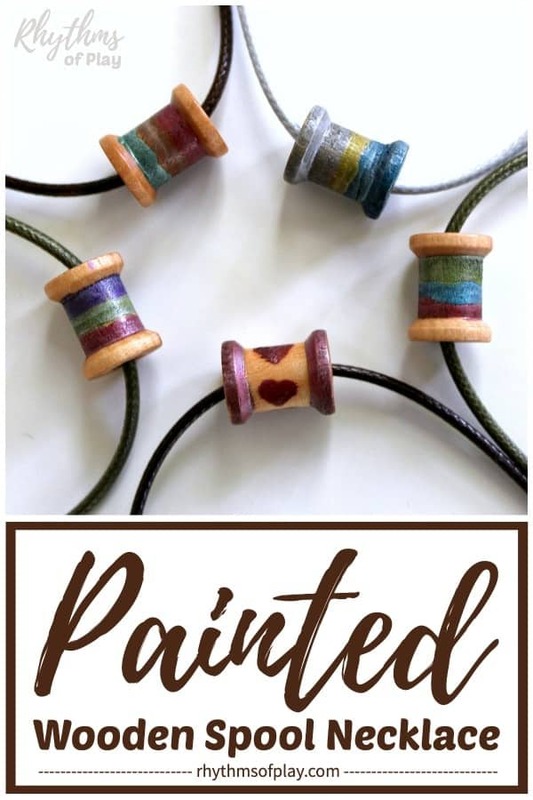 The best thing about a painted wooden spool necklace or bracelet is that you can personalize the wooden spool however you like for mom, dad, a friend, or a favorite teacher! Use their favorite colors, write BFF, mom, or dad… the only limits are the limits of your own imagination. Follow these easy step by step directions to learn how to make a wooden spool necklace. 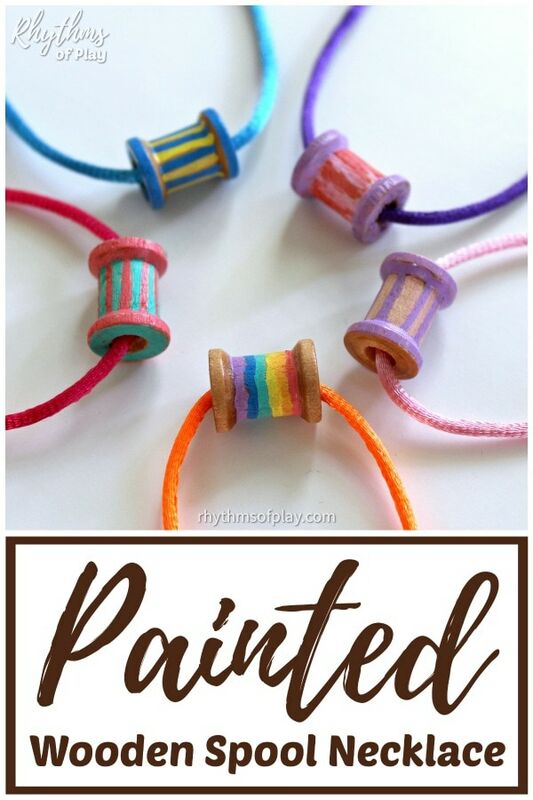 Paint wooden spool beads with paint pens to decorate the wooden spools before you string them onto necklaces or bracelets. Paint pens and metallic brush pens make decorating wooden spools easy! You can also dye wooden spools using this easy colored wooden bead tutorial. You’d be surprised how nice a painted wooden spool looks once it is strung onto a necklace or bracelet. We came up with lots of fun ways to paint wooden spools to decorate them. We have provided lots of photos in this homemade jewelry tutorial to help you come up with decorating ideas. Try any of the fun decorating ideas below, and allow painted wooden spools to dry before moving on to the next step. The easiest way to seal and protect decorated wooden spool beads is with a spray varnish outside, or, in a well-ventilated area. Put the painted wooden spools in a small cardboard box like a shoebox, or the lid of a shoebox, and then roll them around as you spray the varnish. Make sure you continue to roll the painted wooden spools around a few times as they dry so they don’t stick to the cardboard box. 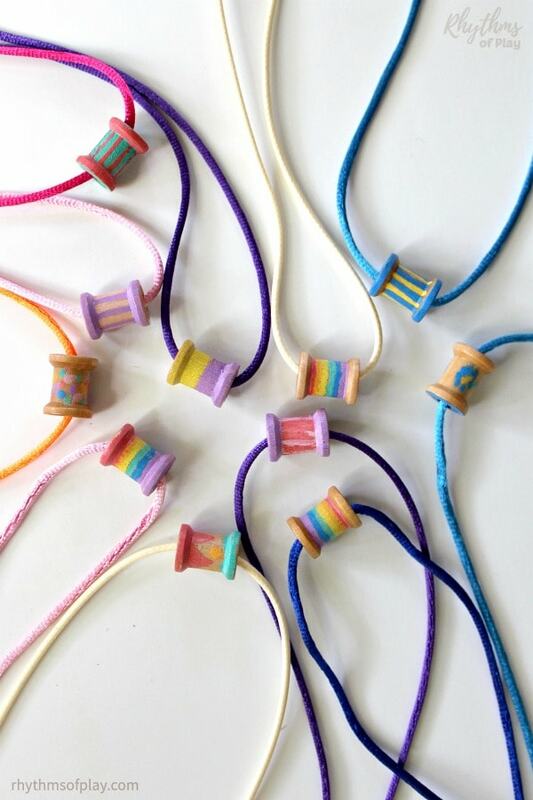 String decorated wooden spools onto a piece of yarn or embroidery thread, use a ready-made necklace or with wooden spools, or make your own beaded necklace. Making your own beaded necklace with the wooden spools is easy, just click the link to learn how! The wooden spools in the photographs below are painted with metalic brush pens . The wooden spools in the photographs below are painted with extra fine point paint pens . 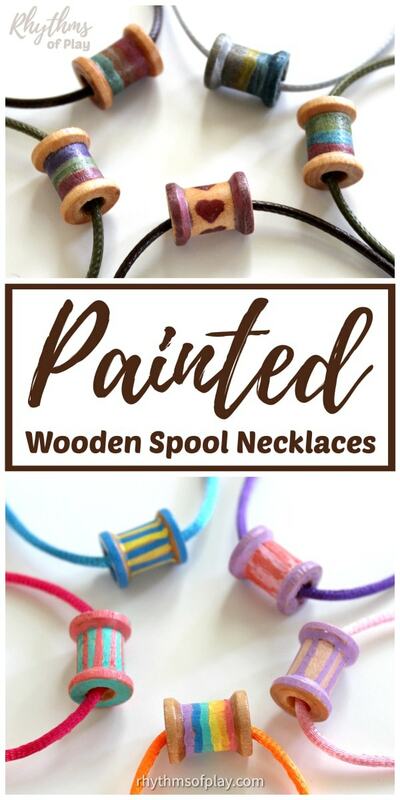 A decorated wooden spool necklace or bracelet make an easy gift idea that kids can make for a friend, teacher, parent or grandparent. The best thing about painted wooden spool necklaces is that you can personalize them however you like for mom, dad, a friend or a teacher! You may also like making an alphabet necklace, a name necklace, or a mom or mum necklace!